I took a look at the regional radar at lunch today and it shows something I haven't seen in many months. Purple. The green and yellow in Minnesota is rain. There is a diagonal line across the Dakotas. On one side, the precipitation is green on the other side, Purple. I suppose this could be interpreted as a good omen for the Vikings but what the purple really means is snow, well, sleet is more likely. Purple means mixed precipitation. 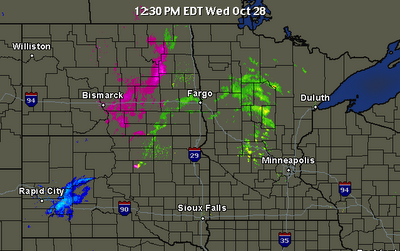 The Blue down on the North Dakota/South Dakota boarder is frozen precipitation for sure though. The line represents a clod front as a large low pressure system moves into the region. 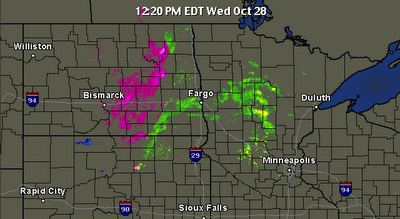 So by the end of lunch there have been interesting changes to the radar. See that little hint of blue above. Remember that's the snow. Look at the new image from 30 minutes later. Less sleet, more snow. The forecast says it will all be rain when it gets here but snow can't be too far off. There are reports of heavy snow from this system in Colorado. I think we'll miss out on that but weather always keeps you on your toes. All that pink and blue only makes a hot beverage or a fire in the fire place all the nicer! Does the nature center have any firewood they would like to see get hauled away for free . . . by me? We DID have a lot of wood after a tornado came though a few years back. Some of the damaged and downed trees were cut up to make firewood for our maple syruping operation. Large downed trees were milled into lumber onsite. We do still have some really nice black cherry, maple and oak lumber for sale but I wouldn't recommend burning it! You can read all about the storm on the nature center website.